Here you can see the color changes considerably in different lighting. However it does look like the MSS Modular sleep System sleeping bag. The Shangri La 3 isn't anything like a camoflage outfit however. It has a grey section sewn along the door opening, not pictured at GoLite online, as well as, three grey Logo emblazoned vents for ventilation near the peak that are pictured online. 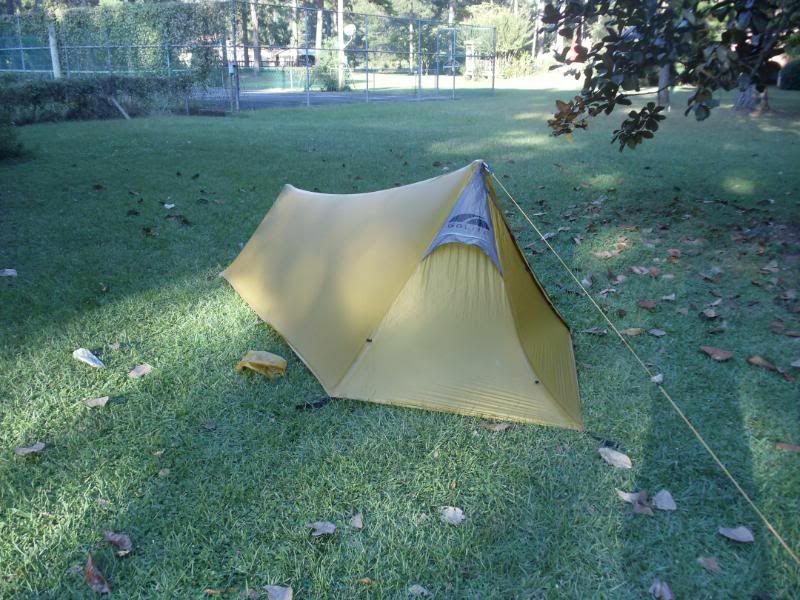 I only received 6-GoLite DAC 6-5/16 inch tent stakes, the minimum for pitching this tent "as is". There is a DuoMid pitch "option", discussed online, however that involves additional tie-outs. I purchased additional 8-GoLite DAC tent stakes in anticipation, because I want to use 11-GoLite DAC stakes for every tie-out around the perimeter, plus check out one or two stake out points from the attachment points higher up the sides, or, keep the panels at the door pulled back. I expect to purchase other stakes to see if I like those stakes better, and check out different pitching options. Last edited by ConnieD on Wed Feb 08, 2012 11:57 pm, edited 1 time in total. My initial impressions: 2 1/2 lbs. does feel like a "loaf of bread. The material feels heavier than my Oware AsymTarp 1, of course. The material feels "sticky" in contrast to the Oware AsymTarp 1, but not too "sticky". It must be the fire retardant. The door zippers double-zipper is heavy duty. I thought the door zipper might be more lightweight like my Sierra Designs or North Face tents. Last edited by ConnieD on Thu Feb 09, 2012 12:14 am, edited 1 time in total. Shangrila 3!Now round up a moose and a bear to test it out to see if it fits the "three"..
Looks like you got a good one there!I like the looks of those tents! 1. The features are better features than I expected. 2. I think lots of military and ex-military would like that color because it compliments their military gear. More military-types and ex-military are carrying a more lightweight pack these days. I love these tarps. I have the SL5,the Hex3( older version of the SL3) and the SL1. I have been using the SL1 for years as my main winter setup. The older ones used a grade heavier fabric which I like better. The SL3 is really better for 2 people my size. The SL5 however is a palace. I think a tent woodstove would be great in there. I only have pictures of the SL5 on my laptop at home. Last time I used it I had to pitch it in a maelstrom and was so dang happy to get inside. Quick, square, and easy to pitch. I have had the SL2 also but I just couldnt get around the poles well enough. It is rock solid however. I sold mine.